Under eye circles and puffiness are one of the most common beauty complaints and are usually genetically inherited, or accrued from late nights at the office, lack of sleep, and general stress. I have tried hundreds of products that promise to cover and hide the “sleepless night look” so many of us sport under our eyes. Here are some of my picks to combat and conceal- and help anyone who is tired of looking tired! 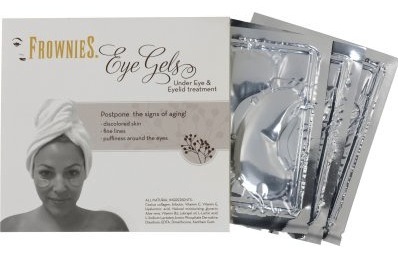 Frownies eye gels are the first step in achieving a deflated under eye area. The anti-wrinkle treatment contains strong anti-oxidants that not only help protect the sensitive skin, but in one thirty minute treatment 100% of women saw a reduction of fine lines, puff and dark circles. The weight of the patch soothes the under eye area and fights free radical damage. For optimal results, all you have to do is use the gel three nights in a row and then sporadically once a week from there on out! 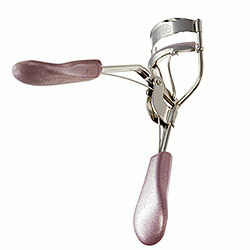 They’re also great to use before any special nights out or as a 30 minute treatment. Frownies are a tinseltown staple and a favorite of Raquel Welch, Rashida Jones and the entire Kardashian clan! We are always looking for no-fuss makeup during the summer months and tinted moisturizers seem to do the trick. 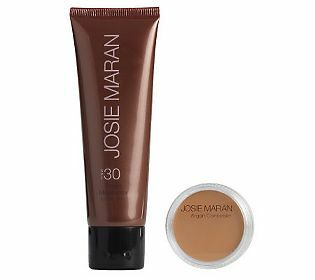 This one from Josie Maran is no exception…they are taking it one step further and pairing their moisturizer with a full-coverage concealer. The moisturizer offers a sheer, lightweight SPF formula infused with Argan Oil to leave your skin feeling smooth and looking flawless. And for those days we need a little extra help, the concealer helps to hide dark circles, redness and any uneven tone you might have. I have a confession. While my blog is centered around my love for mascara, it’s not actually my favorite beauty product. I don’t mind leaving the house without mascara on, but will I ever leave without eyeliner? Heavens no! Eyeliners are fantastic at defining your eyes and making you appear more awake, which is incredibly important if you’re a chronic blogger that can spend 12-18 hours in front of a computer. Check out some of my favorite luscious and long-lasting liners, and see if they don’t become your must-have beauty tool, too! If your eyes are super sensitive to the products you use, then you will love Tarte’s SmolderEYES Amazonian Clay Waterproof Liner ($25 on Sephora.com). Aside from being nice and creamy, this eyeliner is paraben-free and has Amazonian clay to moisturize your lids. Oh, and the best part? It also has a smudge brush at the end of it, making it easy to create the perfect smoky eyes. For an eyeliner that won’t cost you a ton of money, Essence’s Eyeliner Pen in Black ($2.49 on Ulta.com) has you covered. What can you expect from an eyeliner that costs less than $3? A whole heap of magic with a smudge-proof formula that does a great job at lasting throughout the day and goes on precisely every time thanks to the Japanese felt tip. This eyeliner had me at hello. CoverGirl LiquiLine Blast Eyeliner ($7.03 on Drugstore.com) is definitely one of my favorite eyeliners simply because the pigments are so intense. It comes in six different colors from Green Glow to Blackfire, but my favorite is Blue Boom which has a metallic finish and looks stunning on the lower lash line. For those days when you don’t feel like wearing an eyeshadow, these liners will make your eyes pop with minimal effort. One liner that I will forever repurchase is Urban Decay’s 24/7 Glide-On Eye Pencil in Zero ($18). Even if my eyes water up due to allergies, I accidentally rub my made-up peepers or I fall asleep without washing my face (the horror! ), this eyeliner won’t go anywhere. The price is a little steep, but with quality this good I just can’t live without it! Sally Hansen’s Natural Beauty Forever Stay Eye Pencil ($7.95 on Drugstore.com) is a paraben-free liner that really surprised me! It has a stellar formula that not only feels good on the lids, but lasts all day, too. It can be really difficult to find affordable paraben-free eyeliners that also work well, so this baby is definitely one to grab—and fast! Do you love eyeliners? Which of these is your fave? Which beauty product do you never leave the house without? The first thing you can’t forget to put in your beach bag is of course, sunscreen. Neutrogena’s Ultra Sheer Dry-Touch is an affordable and reliable choice as it’s lightweight but still offers significant protection. Plus, it isn’t greasy so you can use it on your body and face. But those aren’t the only places that need a little SPF. The delicate skin on your lips should always be protected. Kiehl’s Lip Balm SPF 15 is a favorite of ours because it is available in various glossy colors. The sun can also damage hair if it isn’t properly protected. Rene Furterer’s Okara Protect Color Radiance Enhancing Spray helps protect color-treated hair from fading while nourishing with Vitamin E.
A great hat, like this Hat Attack Raffia Medium Brim Floppy, is another way to protect your skin and hair from the sun. But just because you aren’t getting those sun-kissed cheeks the natural way doesn’t mean you can’t fake the rosy look with tarte’s natural cheek stain, which stays put better than a powder blush. Cover-up in style with Calypso St. Barth’s Samantha Embroidered Tunic. It’s available in array of lovely colors, but it does run a tad small so order one size up. It’s just as important to keep your skin and body hydrated as it is to protect it. Drinking a lot of water is great for your health but can be harmful to the environment if you use disposable plastic bottles. Take care of yourself and the planet with recycled and refillable EarthLust Stainless Steel Water Bottles in stylish designs. And when your face needs a cooling refresher, give yourself a spritz 2 Note Perfumery’s light face mist. You can throw all these great products in this tote from Jonathan Adler. We love how you can choose your favorite print or your favorite destination! Summer make-up should be a few things: easy to apply, natural-looking, portable, long-wearing and of course, beautiful. But a bargain, too? Now that’s asking a lot. When we tried the tarte Glow Your Way to Gorgeous 8-piece waterproof essentials collection, packed with blush, bronzer, cream eye shadow, lip color, concealer, mascara and eyeliner, all shades we were OBSESSED with, the price seemed to good to be true. 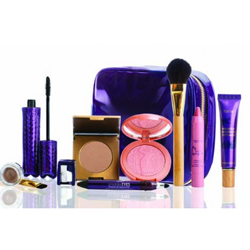 But, QVC is offering this cute set for less than $50! This collection comes in a glamorous purple make-up case that is the perfect size for the on-the-go gal to throw in her purse or weekend bag. It has almost every beauty product you need to pack for a summer vacation where you want to look effortlessly flawless and rock a beachy glow. All you need to bring is your favorite base-like foundation or tinted moisturizer. Every item in this collection is waterproof, which for mascara usually means that it’s not only drying but also difficult to remove. This mascara works a lot like the drugstore favorite Maybelline Great Lash but with extra staying power. However, it still comes off easily with eye make-up remover. The concealer really has staying power too, even to cover those nasty under-eye circles or an unfortunate blemish. Plus it comes in an array of shades for every skin tone. I’m not normally a fan of cream eye shadow because of its tendency to crease, but tarte’s formula is crease-free and in an amazing bronze-y brown shade which looks stunning with any eye color. It’s perfect for a natural daytime look. The smoldering dark purple sparkle eye liner is all you need to spice up your look for nighttime, and the thick stick makes applying it a breeze. Great bronzers are hard to come by. Tarte’s Mineral Powder Bronzer in Park Ave Princess is matte which makes layering it on for the perfect blend super simple. We love, too, that this collection comes with bamboo brushes for cheeks and eyes. Everyone always needs new brushes and doesn’t always think to get them. Make-up looks professional and feels light when applied with a fresh brush. A sharpener for the eye and lip pencil is also included. A lot of women skip blush in the summer and just slather on the bronzer, but blush is a key component in enhancing (or faking!) a healthy summer glow. Use the bamboo brush to sweep on the Amazonian clay 12-hour blush, a flattering peach shade which, again, looks great on all skin tones. Speaking of shades that flatter everyone, the lip pencil, which is surprisingly glossy and not matte, comes in a natural pink for the perfect flush. The set also comes with a free sample of maracuja oil which is known for its moisturizing properties. It is so rare not only to love every product that comes in a gift set but also for it to have such a great selection of universally flattering colors. The set will be available for an unbelievable $49.94 on July 2 and after that for $59.93, which is still a great value as it includes over $205 worth of products.